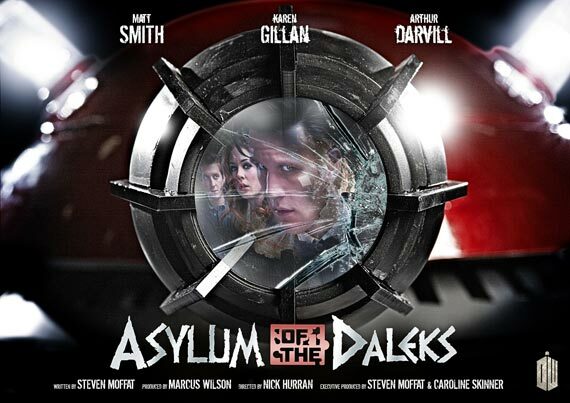 I know I'm a little late to the party (all the other reviews I've seen were posted within hours) but I wanted to share a few thoughts on Asylum of the Daleks. Overall I have to say that I really enjoyed it. It seemed to fulfil all the criteria needed of a standard season opener. It re-introduced us to the regular characters and allowed us to catch up with what had happened to them since we last saw them. It told a relatively straightforward, yet engaging, story and, as a bonus, brought back the series' most iconic monsters. Oh, and there was the big surprise guest star as well. Before the episode was shown, there were a number of complaints on the message boards from people who were bemoaning the fact that the Daleks were being brought back yet again. The main complaint seemed to be that all Dalek stories were the same: the Daleks do something evil like invade Earth, the Doctor arrives and defeats them. Again. Fortunately Asylum of the Daleks bucks this trend somewhat. In fact, the Daleks come out of it rather well overall. They score a major coup in the early going by capturing, the Doctor his companions and the TARDIS in a manner so absurdly easy that one wonders why they haven't tried it before. It's as if the Daleks realised they only had 45 minutes for the story so had to go for the simplest plan they could think of. Once they've captured the TARDIS crew the new Dalek Parliament then manage to get the Doctor to do their dirty work for them and go down to the Asylum. Incidentally, I'd love to know more about how the Parliament is set up. Are there different political parties? What are their policies? And how do Daleks hold the little pencil when they're in the voting booth? 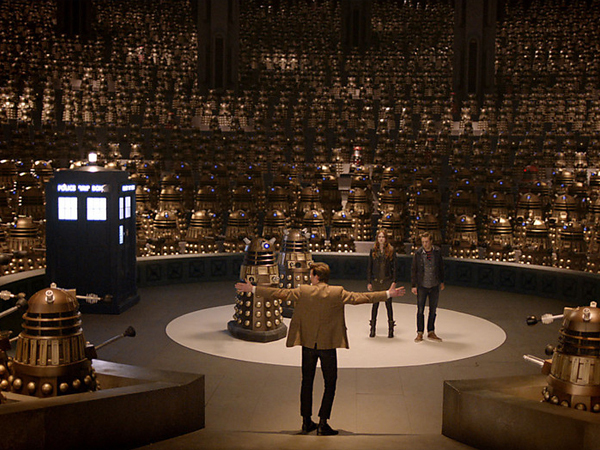 The Parliament of the Daleks looks very impressive, with literally thousands of Daleks surrounding the Doctor and his friends. Coupled with the impressive opening shots of the the planet Skaro, you can see that money has been spent. Sadly it looks as if a lot of the money ran out when it came time to film inside the Asylum itself. The entire complex seemed to consist of a couple of rooms and a corridor as well as a dozen, mostly inert Daleks. It all seemed a bit low-key after all the previous spectacle. 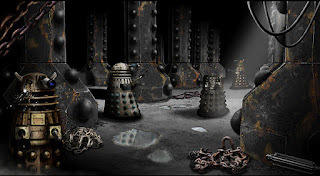 Another thing that was doing the rounds on the message boards after the episode aired, was the surprising lack of old-school Daleks. Most of them are shrouded in darkness and/or cobwebs and any real action is performed by the more recent bronze Daleks of the Russell T Davies era. I admit that I was a little disappointed myself at the time however, on reflection, I can see why the older Daleks were kept in the background. The youngest of the classic era Dalek props that did appear was close to 25 years old with the oldest pushing 50. It's a fair bet that most of those props were in no fit state to be operated and so, by necessity, had to be relagated to sitting in the background of various shots. It's a shame but understandable. Anyway, despite all the evidence, this episode isn't really about the Daleks. It about the relationship between Amy and Rory and the relationship between the Doctor and Oswin Oswald (who may or may not be the new companion). Amy and Rory's impending divorce seems to come out of the blue; even the 'Pond Life' mini story on the BBC Doctor Who website doesn't really hint at any serious relationship troubles until the final minute or two. Their reunion, although touching, seems somewhat 'convenient' and I can't imagine that their problems are over as easily as that. It'll be interesting to see how things develop for them over the next few weeks. The Doctor and Oswin's relationship is far more interesting as it feels as though we're getting a trial run of how things will be once Jenna Louise Coleman appears full-time. Despite the fact that they don't get to act face to face (and considering that Oswin's scenes were probably filmed months after the rest of the episode was shot) there is a real spark between the two characters. 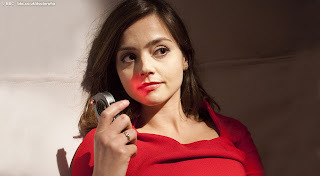 For what it's worth I was genuinely surprised when Jenna Louise Coleman appeared 4 months earlier than expected. Even then I still didn't expect her to have such a prominent role. And by the end of the episode I was left wondering how her appearance in this episode ties into the Christmas episode. Is she going to be playing the same character? And, if so, how does she end up as a Dalek (if indeed she does - I have my own theories on that.)? One of the things that I was concerned about when this series of 'stand-alone stories' was first announced was that ongoing storylines and story arcs would take a bit of a back seat this year. But that's definitely not been the case. We have the ongoing Amy and Rory saga, the mystery of the new companion and now the Daleks have no memory of the Doctor. Their repeated chanting of "Doctor Who? Doctor Who?" brings us back to the very end of the last series and "the question that must never be answered." There's no doubt that this is all building up to the 50th Anniversary next year where maybe, just maybe, that question will be answered. So, all in all, a good opening episode. Roll on 'Dinosaurs on a Spaceship'.